Have you been looking for a better way to organize your sweepstakes entries. Many sweepstakes sites have a “favorites list” or a way for you to organize the sweepstakes you find on their site but that doesn’t help you to really organize all of your sweepstakes. What you really need is software or a complete system so you can add sweepstakes you find on SweetiesSweeps.com, from other sweepstakes sites, Facebook, a friend, and any other place you might find a sweepstakes you want to enter. NOTE: please use this software to replace the Favorites List on SweetiesSweeps.com. It will no longer be available as of July 1st. The Favorite List will still be available for our Secret site members. One way to organize the sweepstakes you find is to create a Bookmark List in your browser. You can add the entry form page and also create folders for your daily, weekly, monthly, etc sweepstakes. 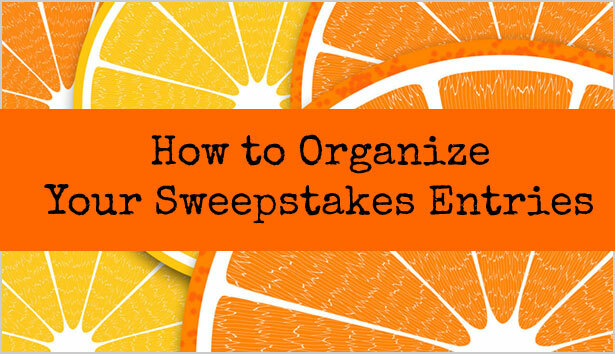 Another way is to use a sweepstakes organization program like Sweep! The Sweep! 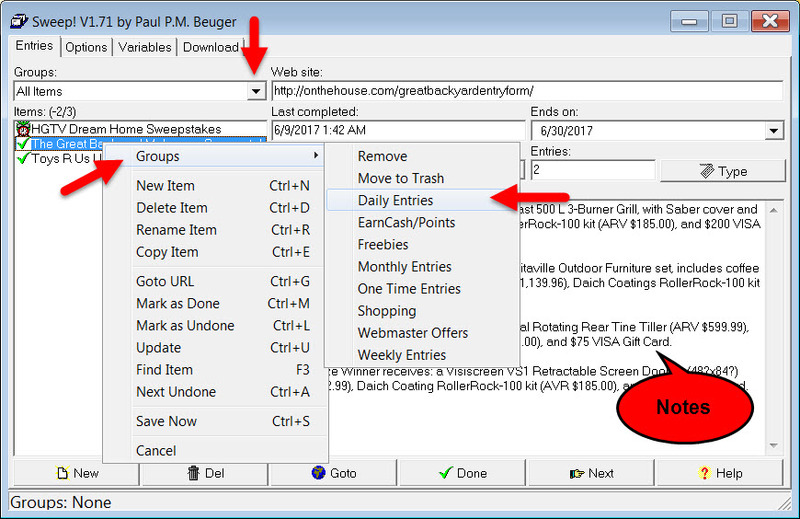 program by Paul Beuger is free and will allow you to add sweepstakes, organize them in groups, load them all at once to make entering faster and more. It also keeps track of when you entered so you never forget. This software is no longer supported by the author but works well on most Windows computers. We haven’t tested it with Mac computers and it probably will not work on a smartphone or tablet. Click Here to download the Free Sweep! Program version 1.7. While there is a newer version, 1.8, we don’t suggest using it because it is missing features that are in 1.7. NOTE: When you open the Sweep! program, it will have old sweepstakes added as an example. To delete those, just right-click on each one and left-click delete. Or, click on one and click the DEL button at the bottom. 1. Click New and give the sweepstakes a name. You can name it whatever you like. 2. Type the link to the entry form in the Web site: box. 4. Click the Calendar and pick the end date. 5. Click Goto to launch the entry form page in your browser. 6. Once you are finished entering, click Done. Today’s date and the time you entered will appear in the Last Completed box. Adding Notes: You can also add notes (rules and comments) which is helpful for adding the prize list and other information. Once you add a title and the link to the entry form, you can add the sweepstakes to a group (weekly, daily, monthly, etc). This is different from the frequency (repeat) because then you can just go to the weekly frequency list and enter them all at once. How to Organize by Groups: after you add a sweepstakes, right-click on it and then left-click on groups and then on the group you want from the list provided. At the current time there is no way to add a new group name or rename existing groups. How to Use Groups: Click the Groups drop-down list and click on a Group. All of the sweepstakes you have added to the group will appear on that list. Then use one of the methods below to either select all of the sweepstakes or some of them to load all at once. Loading All Sweeps at Once: If you have a daily list of sweepstakes you want to enter, select the whole list and click Goto. They will all open in your browser at the same time. Then use your form filler to enter each one. This makes them load faster so you can enter faster. How to Select the Whole List of Sweeps: click on the top sweepstakes on the list, hold the Shift key down, scroll down and click on the last sweepstakes on the list. Then click Goto. 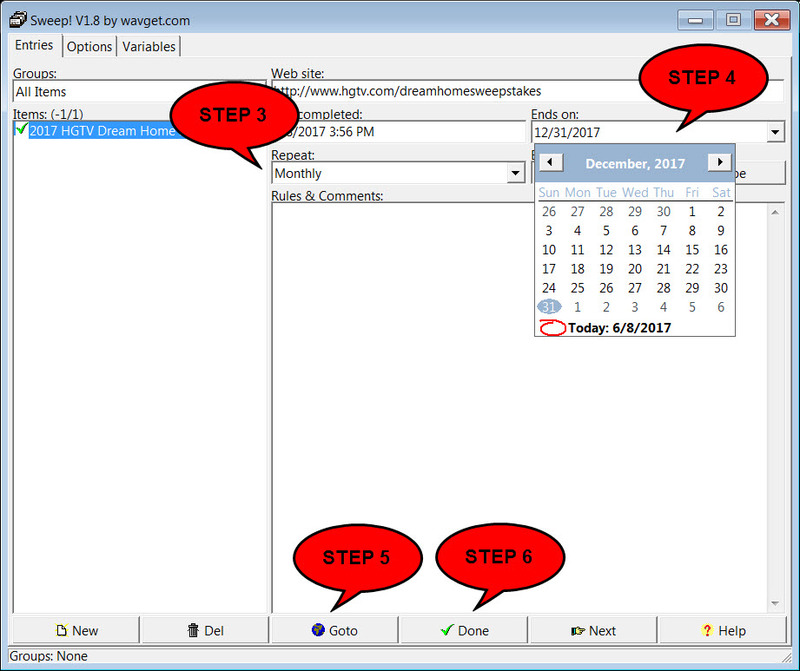 How to Select the Just Some of Sweeps: click on the first sweepstakes you want to enter, hold the CTRL key down and click on any of the other sweepstakes from the list. The click Goto. More Help: If you need more help, click the Help button at the bottom right in the program and click on the Quick Startup Guide. If the Help menu gives you an error and doesn’t come up, click on the Windows Start menu, All Programs and then Sweep and you can access it there. anyone use the software? it seems to take more time to setup than i want to but i like opening them all at once and filling the forms out. but still no way to get away from recaptcha! i HATE it! I entered a bunch and can’t get my daily group to all open at the same time?! I’ll just stick with bookmarking them. Thanks for your instruction,i would try it. I downloaded it twice, but it will not open. I just use an excel spreadsheet for dailies. I hyperlink the web address into the sheet and just click on the hyperlink to enter. I put in the date it ends and sort by that. Once it ends, I move it to an expired spreadsheet. The program will not execute with an OS greater than Windows 7. You can always set the properties (right click & select check box “Run in Windows 7 emulation”0. This should solve your problem.